A well crafted job description will clearly tell you what the employer is looking for - so pay attention. We recommend printing out the actual job description and highlighting the responsibilities and any key words that are used. By doing this, you will be able to clearly identify what skills and experience the employer is looking for so you can effectively match your experience. While you assume your resume is all about you, and you are partially right, you must always keep in mind the needs of the reader, because in their mind it is all about them. Keep your messaging relevant to the position for which you are applying. Your resume is not an exhaustive list of all your skills, but rather a document explaining your qualifications for a specific position. You want to make sure that your resume is pleasing to the eye in terms of style, font, and spacing. Use clear headers and stick with modern and professional fonts like Arial or Times New Roman with a font size of 12. While you want to make the document visually appealing, it is the content that matters most, so steer away from images and colors. For some more creative roles (i.e. marketing) you may want to consider adding some professional design to it. Never send off a resume without thoroughly proofreading for spelling, grammar, punctuation and relevance. Before you submit your resume to a prospective employer ask a couple of trusted friends to review both the job description and your resume, and ask for and graciously accept their feedback. The more honest and critical feedback you receive, the better your final resume will be! After the edits and before sending, ask yourself "would I hire me?" Fold a piece of 8.5x11 inch paper in thirds, as if you would be sticking it in an envelope. That top section is the amount of time you have to grab the hiring managers attention. Use that space wisely - we suggest beginning with a qualifications summary, and a list of 3-5 bullet points matching your qualifications to the position they are hiring for. Also, be sure to not embellish your qualifications, as most times they will be verified. 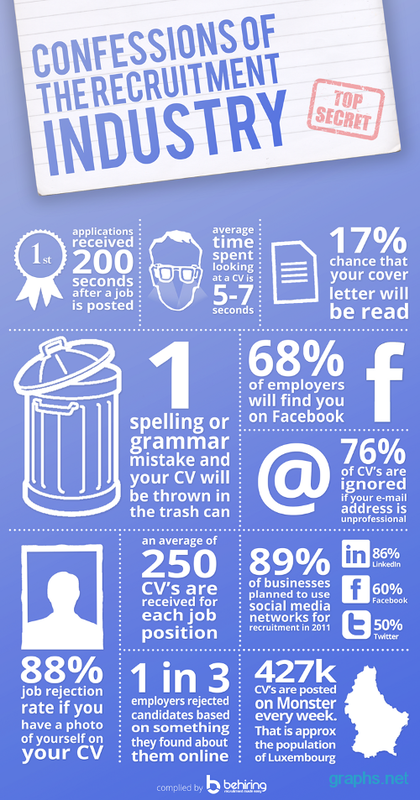 - On average a resume is reviewed for 6 seconds. - There is a 17% chance your cover letter will be read. - 76% of resumes are ignored if your email address is unprofessional.